Mix and Chic: My living room revealed! As promised, I am going to post more pictures of my living room today! I have never published any pictures of my home previously because not a single room is completed. For some reason, I decided to decorate my living room first, perhaps it is my most favorite room. The beautiful vaulted ceilings, the charming stone fireplace and the wall of closets in the living room are some of the great features that stole my heart when I first saw this home. We bought this home after relocating from North Carolina last year. Being a young family and living in a household with only a single income, we do not have a generous budget to work when it comes to decorating. Therefore, every piece of furniture and accessories you see in the following pictures are purchases made from big box stores, mostly bought during sales or clearances. Speaking about stand-ins, the chair, the faux plant and the terracotta warrior figurine are temporary solutions in the living room as well. I am still looking for the perfect piece for this little corner. I know what you must be thinking. Yes, the television is huge. Our previous living room was quite spacious so we opted for a bigger tv. I love this furniture layout but in reality, the white sofa faces the tv. I hope to get another sofa or two more chairs (that faces the television) in the future so I can retain this layout. A closer look at my coffee table vignette. I have a few accessories lying around the house so I just put this together in a jiffy to create some visual interest. What do you think? We took some pictures of our living room before we moved in but the pictures were missing. 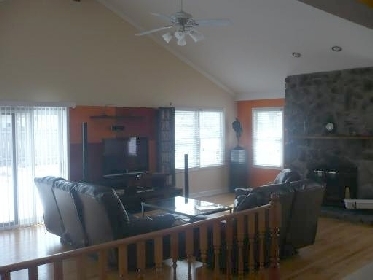 Anyway, to give you a general idea of how our living room looks like previously, here is an image from the real estate website. Not my furniture or my entertainment unit. When we first saw the house, there is this orange and red color blocking on the walls. The orange paint continued on both sides of the fireplace. The other walls are mostly painted in beige with the exception of an interesting mural across the tv wall. (We lost the mural wall pictures, I will update this post again once I find the pictures.) Blinds were installed in majority of the windows in this house including the sliding glass door (with vertical blinds) that leads to the outdoor deck. Of course, we have changed things since we moved in. My design process was fairly simple. I had a general furniture layout idea in my head and then, I started to do some window shopping. When I shop, I don't always have any specific pieces in my mind, I just went with what I like and thought might look good in the space while hunting bargains along the way. The room evolves over a period of more than seven months with some older pieces from our previous home as well. Without a doubt, this room will continue to evolve and I will definitely post updates when something changes! I hope you enjoy my living room tour. My wonderful readers, thank you for all the lovely comments yesterday! You guys are simply the best! If you are interested to know how I scored my sofa and floor lamp below regular price, read here. I love your eclectic style. Jessie! You've done a wonderful job mixing colour, pattern and texture. The result is a living room that's as inviting as it is interesting to look at. Thank you so much for sharing your home with us. I hope we'll get to see more in the future. Have a lovely day, Jessie! LOVE LOVE LOVE it!!!!! Thank you so much for agreeing to share it with me to include in HoF! Ps, I love the prints on the fireplace! You did such a great job! I especially like those stools in front of your fireplace! Looks beautiful! I love the stone fireplace and the fashion sketches are really cool. They're a fun mix! Good luck on the rest of the house! Can't wait to see it! I think it's a very cozy living room. And the white sofa with the colorful pillows are my favourites. Well you do have a large TV but so do we and I think our space is smaller, so it didn't catch my eye at first. Very nice Jessie- from following your posts here in blogland I can honestly say: It's Sooo You! Isn't it a great feeling completely finishing a room! Beautiful room!! I love your style, Jessie! Jessie, It is wonderful. You did such a great job. So many great ideas. Great job Jessie! I love those stools in front of the fp too. Great coffee table and accessorizing. Thanks for sharing this with us! oh my goodness! this is your home?! IN LOVE! Jesse! I am so glad I didn't miss this today - I LOVE what you have done - and you have my favorite area rug!!! A great 'mix' and VERY chic! Great job! Jessie!!!! The previous owner is going to want the house back!! You have done amazing work! You are quite the stylist. And I am so happy, SO HAPPY, that you have YOUR style! You are not a follower - you are a trend setter! P.S And it was of course House of Fifty and the blog shout-out I was alluding to the other day. (I hope you saw that comment). Congratulations! love, love, love it! your living room is gorgeous and I love how you shared your budget and resources. and congrats on your feature, girl!! wow its gorgeous! looks so comfy! I love the little coral branch! adorable!! I was very intruiged by the glimpse from the article yesterday so I am so glad I stopped by today! I absolutely love your living room! The rug has got to be my favourite element. I am also so grateful that you shared your resources! ADORE you living room Jessie - i am amazed - well done and what a great space you have. Great post! Love your living room. I'd love to see photos of how it's usually arranged as well. I am always curious about how people actually live in a space. The colors you used are awesome! Love them. Will be pinning it. Love the living room! Modern and still very warm and inviting. I have been the biggest procrastinator with finishing our house, we have lived here for 3 years.lol. This motivates me to want to actually get things done! Oh my I love your living room. 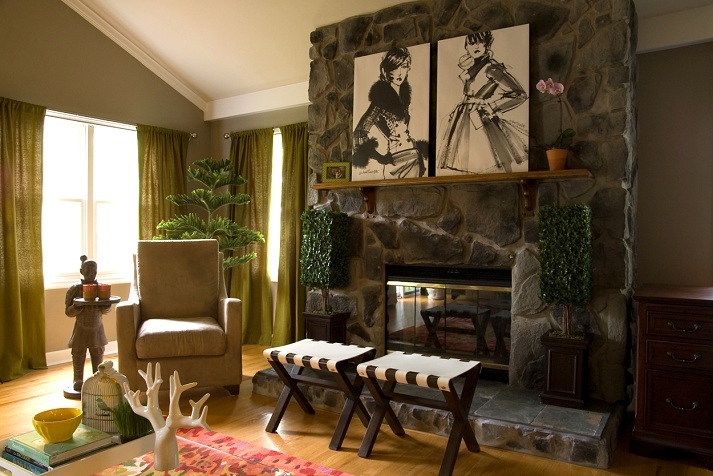 The fashion prints above the fire place are stunning. So incredibly beautiful. It's lovely! Hats off to you for doing it so well and so frugally! What a great transformation! Your room is so warm and inviting. Great job! 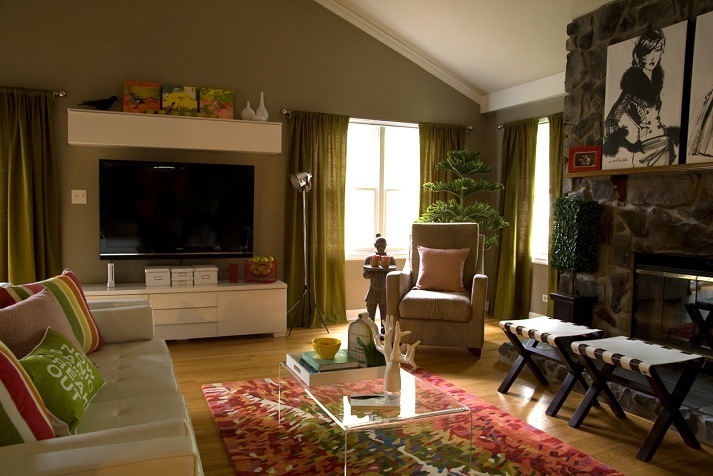 I LOVE what you've done with your living room and your eclectic style, it is so YOU! Wow! I really really like it! The colours so nicely chosen, the fireplace the sofa... everything! Thanks for sharing! Of course I'm gonna do that! I will let you know when I post it. Can't wait to see the rest of your house. Thanks for visiting my blog! This room is fun, cozy and oh so stylish! You have amazing taste. I have a long ways to go in my home....thanks for the inspiration! You had me wondering for a while but it is a personal choice..I have not shared a full room yet..just parts for the same reason - I am changing things around and so in my mind the rooms are not complete. Well done..it looks great..the pics on the mantel are totally you and the stools against the stone fireplace..love it! 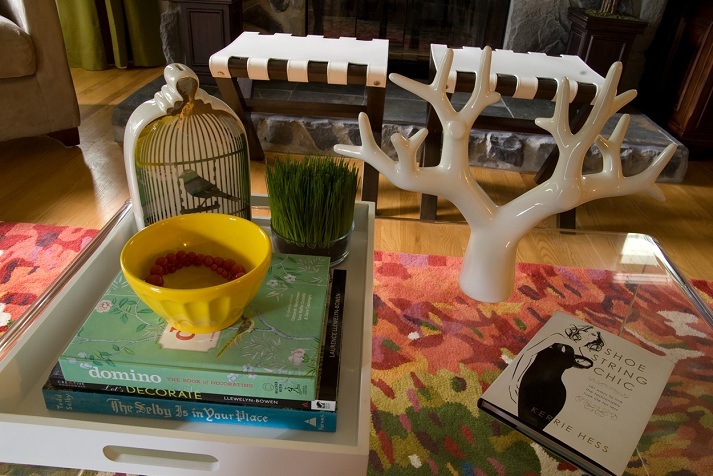 And the coffee table vignette is pretty with the colors and you have nature in there, too. Jessie you have wonderful style....there are so many things to love here. The rug and the coffee table are perfect. You have managed to pull this room together on a small budget and in my opinion that takes real talent. It has a very collected look and you should be proud! I'm a little behind on blog reading but I must say your livingroom is stunning! What you have done like you said on a limited budget is amazing. Great style & tons of creativity. Like you my dream was to be a fashion designer so I too like to add touches of fashion to my home. I need to do some home improvements in my apartment and your ideas are inspiring! LOVE your living room Jessie!! Oh my gosh, it's gorgeous!!! Those fashion prints above the fireplace are so fabulous. I'm so glad someone else understands about "stand-ins" my husband always looks at me like I'm crazy when I'm telling him about my plans for a spot that's already got something in it...he'll be like "but what about that?" and I'm like "It's just a stand-in...we can't have an empty space!" haha. You have such great style and I've been dying to see your home- it does not disappoint! You really took it along way from it's original look- beautiful job!! Jessie hi! Just wanted to inform you that today I made a post on your amazing living room. Beautiful job! I love the colour scheme, and the way the rug and cushions pull it all together. Can't wait to see what you do next! I'm at lost of words. Plus, you managed to make it work for the space. Oh how great to see your place finally! What a fabulous job you've done with it! It looks so warm and inviting. The touches of green is my favourite bit - your curtains and those plants. And the mix surrounding the fireplace - the white stools, fashion prints and plants makes such a great composition. And I know all about having big TV's. Hubby is into his TV's too unfortunately. Every year our TV just gets bigger and bigger. This room looks absolutely beautiful! I love the cb2 rug and all of your accessories. And the white ottomans in front of the fireplace. You've done a great job!!!! I found you thru this year's One Room Challenge and will definitely keep following you! Have you thought about mounting the TV above the fireplace? Then you would not have two different areas of focus and furniture layout would be simpler.